Our gym offers physically and mentally enriching classes. We provide fun and challenging preschool, gymnastics, and tumbling classes in a safe and positive environment. This is a program for young toddlers who are participating with a parent or responsible adult. This program meets once a week for a 45 minute class. Additional classes per week are available. We use an educational component --- alphabet, colors, shapes, math, etc. Your children are going to love the educational style gymnastics combined with some new pre-school equipment and new musical tapes. Toddlers have a free-style period to explore the gym and then have a warm-up song to participate with the instructor. The instructor then leads the children through an obstacle course that changes every two weeks. It is a series of activities designed to improve socialization skills through physical activity. The learning of rudimentary movement skills helps toddlers create a sense of mastery over their environment, thereby increasing the child’s sense of self esteem and providing confidence in approaching social situations. At the end of class, there is a short goodbye song. The tots will receive a stamp on their hand and a coloring page to color at home. This teaches the children that their class time is over. This is a program for toddlers who are ready for structure. This program meets once a week for a 45 minute class. Additional classes per week are available. Children must sit with the instructor and have no parental participation. The group participates in activities that develop strength, flexibility, coordination, and listening skills. 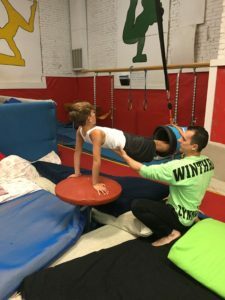 The use of games, music, dance, balls, and obstacle courses, in addition to preliminary skills taught on the gymnastics equipment, creates a fun atmosphere to learn. At the end of class, they receive a stamp on their hand and a coloring page to color at home. This is a program for children who are ready to start learning more difficult skills in the sport of gymnastics. This program meets once a week for a 1 hour class. Additional classes per week are available. 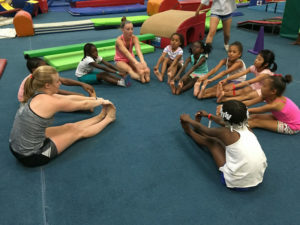 These children still enjoy the younger side of learning, yet they are being prepped for more serious gymnastics instruction. They do not use an obstacle course, but are working on several stations used to develop skills for Olympic style gymnastics. This is a program for children who desire to learn the more advanced skills in the sport of gymnastics. This program meets once a week for a 1 hour class. Additional classes per week are available. All students receive gymnastics instruction on each Olympic event. They also work on a trampoline and tumble trak. The class emphasizes the correct execution of skills, developing strength, and increasing flexibility through constant repetition of basic gymnastic movements. Our tumbling class is for students ages 11 and older who are interested in tumbling only. Students work on floor skills, trampoline, and the tumble trak. This class is great for cheerleaders.